Goffman defined stigma as “An attribute that is deeply discrediting” and that reduces the person who bears it “from a whole and usual person to a tainted, discounted one. Stigma experienced by the patients with mental illness is of two types:-public stigma and personal stigma. Public stigma: it is the prejudice endorsed by the general population and manifests as discrimination toward people suffering from mental illness. Personal stigma: It consists of perceived stigma, experienced stigma and self-stigma. It is the prejudice which people suffering from mental illness turn against themselves. As self-stigma is hidden, it seems to the worst type of stigma among all its forms which directly affects the patients overall well being. Stigma causes impact on multiple domains which includes social exclusion, reduced opportunities for education and employment and impaired quality of life. Most patients with mental illness hesitate to use health services mainly because of two reasons. First, they do not want to be labeled as a “Mental Patient” and second to avoid the consequences associated with stigma. Therefore People suffering from mental illness not only have to cope with psychological, biological, and cognitive symptoms but also with consequences of stigma. Self-stigma also leads to reduced self-esteem and self-efficacy. Hence, it is important to study stigma across various socio cultural regions. Both schizophrenia and alcohol dependence syndrome are one of the most common and severe mental disorders., Adverse consequences of alcohol consumption are not limited to physical health, but it also has profound effects on social behavior, interactions, and environment. The stigma further increase these effects by causing hindrance to seek professional and lay help because of fear of being labeled as alcoholics. From the above review, it is evident that stigma experienced by patients with different mental disorders has been studied, but there are very few studies which compare the self-stigma between the patients with schizophrenia and alcohol dependence syndrome. Hence, the present study was planned to compare self-stigma between two illness and correlates it with sociodemographic and clinical variables. Better understanding might suggest the ways to reduce stigma and its consequences. The study was conducted in outpatients and inpatients of Department of Psychiatry, Acharya Vinoba Bhave Rural Hospital, of central India from August 1, 2015, to July 31, 2016. The sample consisted of 100 consecutive male and female patients (50 with diagnoses of schizophrenia and 50 with alcohol dependence syndrome as per International Classification of Diseases [ICD]-10 diagnostic criteria), who were more than 16 years and below 60 years of age, could understand Hindi and willing to give informed consent to participate in the study. Exclusion criteria were patient having comorbid medical illness, patients who were intellectually deficient and patients in need of any emergency medical care. The ethics committee of the institution approved the study. It was a cross-sectional study where the assessments were carried out by a qualified psychiatrists. The diagnosis of both the illnesses was made as per ICD-10 (WHO, 1992). Internalized Stigma of Mental Illness Scale (ISMIS) – ISMIS is an interview-based instrument to assess self-stigma/Internalized stigma, from the perspective of stigmatized individuals. It comprises 29 questions which are divided into five components (alienation, stereotype endorsement, perceived discrimination, social withdrawal, and stigma resistance). All items were measured on a 4-pointLikert-type agreement scale (1 = strongly disagree to 4 = strongly agree). Patients were administered Hindi version of the instrument. The Cronbach's alpha for estimation of internal consistency of the Hindi version scale was 0.863. Various researchers used different cut off but in this study, a cutoff of 2.5 for total and subscales of ISMIS to categorize the presence or absence of stigma was used. Statistical analysis was performed by using descriptive and inferential statistics using One-way ANOVA and Student's unpaired t-test and software used in the analysis were SPSS 17.0 version (SPSS Inc, IL, Chicago) and EPI-INFO 6.0 (Centers for Disease Control and the World Health Organization) and P < 0.05 is considered as the level of significance (P < 0.05). A total of 100 patients were included in the study. 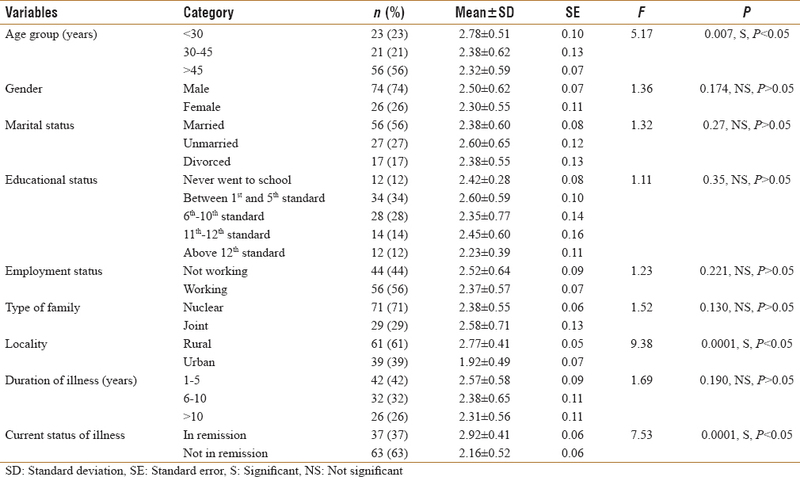 [Table 1] shows sociodemographic data of the patients and correlation of total stigma score with sociodemographic and clinical variables associated with illness. Majority of patients were male (74%) and belong to age group of >45 years (56%). A large number of patients were married (56%) and had formal education up to the 5th standard (34%). Most of them were working (56%) and belonged to rural locality (61%). Majority of them belonged to nuclear family (71%) and had duration of illness within 1–5 years. Most of the patients were not in remission (63%) at the time of assessment. As shown in [Table 1], the total stigma scores were significantly different for all the three age groups, being more in the patients of age <30 years (2.78 ± 0.51) than the patients of other age groups. Furthermore, patients belonging to rural locality (2.77 ± 0.41) had higher scores than the patients from urban locality (1.92 ± 0.49). Total stigma scores were not significantly affected by other sociodemographic variables. Among the clinical variables, patients who were in remission (2.92 ± 0.41) at the time of assessment had higher scores than the patients who were not in remission (2.16 ± 0.52). [Table 2] shows the comparison of total stigma scores and its subscales between the patients of schizophrenia and alcohol dependence syndrome. 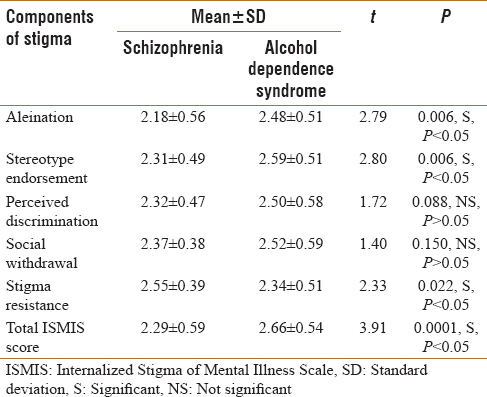 Patients with alcohol dependence syndrome (2.66 ± 0.54) had significantly higher total stigma scores than patients with schizophrenia (2.29 ± 0.59). Furthermore, patients with alcohol dependence syndrome had significantly higher scores on subscales of aleination (2.48 ± 0.51) and stereotype endorsement (2.59 ± 0.51) than schizophrenic patients (2.18 ± 0.56 and 2.31 ± 0.49). However, patients with schizophrenia (2.55 ± 0.39) had higher scores on subscales of stigma resistance than of patients with alcohol dependence (2.34 ± 0.51). In the present study, self-stigma was assessed in the patients with schizophrenia and alcohol dependence syndrome. The younger patients had significantly higher self-stigma as compared to the stigma experienced by older patients. Further, in the present study, participants belonging to rural locality had significantly higher level of self-stigma than belonging to urban locality. The results of our study shows that total stigma scores were not affected by any other sociodemographic variables. Previous studies which correlate stigma among various sociodemographic variables have found contrasting results. Some studies found higher stigma in younger age group ,, and some found higher in older age group  while some of studies found no association with the age.,,,, Higher stigma in the younger age group could be due to the fact that at a later age patients are busy with their jobs and family life and also increased social support from life partner may also help to reduce the stigma. Another reason is that younger people are more fearful about the consequences of illness disclosure on their careers, relationship, etc. In our study, it was found that rural sample had higher stigma as compared to urban sample. A previous Indian study also reported that rural people had higher stigma scores than urban  People belonging to rural locality experience more ridicule, shame, and discrimination as compared to people of urban locality and moreover, lack of knowledge about the illness and its treatment also contributes for higher stigma. This can be overcome by educating them to improve the knowledge about mental illness through poster in local language. However, their attitude of resistance to change act as barrier for reducing stigma. In the previous study, it was reported that the patient with lesser education had more level of stigma than the patient with higher education. However, our study found no such association which was in concordance with many other studies., Patients with low level of education are mostly related to lower socioeconomic status and most of them are dependent on others for their daily life needs as many of them are daily wage worker and place at bottom in social hierarchy. Hence, these people are at more risk for experiencing stigma and discrimination and having the fear of losing jobs. These people also do no protest against such discrimination taking into consideration their social status. On the other hand, patients and their relatives with higher education have fear of disclosing their illness in the society as they have knowledge about the consequences about disclosure of mental illness on their carriers, social status, etc. Hence concluding both these finding, education act as double edged sword for mental illness. The results of our study showed that the patients with alcohol dependence syndrome had higher level of Self Stigma as compared to the patients with schizophrenia. It has been also found in previous studies by Garg et al., Schomerus et al., Dinos et al., Link et al. Patient with substance dependence are less frequently regarded them as mentally ill and are feel much more responsible for their illness, experience more social rejection and negative emotional reactions than the patients with diagnosis of schizophrenia. In the present study, it was found that on the subscales of ISMIS, patients with alcohol substance dependence had higher scores on alienation and stereotype endorsement, while patients with schizophrenia had higher score on stigma resistance. There is paucity of literature regarding these components of stigma being compared between these two illnesses. The result obtained in our study might be attributed to presence of insight in patients of alcohol dependence syndrome as compared to the patients of schizophrenia who mostly lack insight. Intact insight leads to increased subjective experience of being less than a full member of society, respondent's feeling of the way they tend to be treated by others and various aspects of social withdrawal. However, further research is required to establish such an association. The limitation about the study is that the patients who presented to psychiatry outpatient department might be those with lower self-stigma and higher treatment seeking behavior, fact representing a potential selection bias and limiting the potential to extrapolate findings to patients who remained in community. Stigma is one of most challenging area of research in the patients with mental illness. Current study found that patients with alcohol dependence experience higher level of self-stigma as comparative to patients suffering from schizophrenia. Furthermore it was found that younger age, rural background and remission stage of illness were associated with higher self-stigma. Self-stigma acts as barrier which prevents people with mental illness to use health services consequently affecting the course and prognosis of their illness. Therefore, a comprehensive anti-stigma program at the community level must be in place to educate the general population about the treatment options available for mental illness. This will in turn reduce self-stigma and will encourage patients to come forward, avail the treatment and remain compliant. Future research in stigma needs to be clinically driven and quantitative to develop standards of care. Goffman E. Stigma: Notes on the Management of Spoiled Identity. Trad. French Stigmates Usages Sociaux Handicaps Ed Minuit Paris; 1975. Englewood Cliffs: 1963. Corrigan PA, Watson AC, Barr L. The self-stigma of mental illness: Implications for self-esteem and self-efficacy. J Soc Clin Psychol 2006;25:875-84. Girma E, Tesfaye M, Froeschl G, Möller-Leimkühler AM, Dehning S, Müller N, et al. Facility based cross-sectional study of self stigma among people with mental illness: Towards patient empowerment approach. Int J Ment Health Syst 2013;7:21. Corrigan PW, Rusch N. Mental illness stereotypes and service use: Do people avoid treatment because of stigma? Psychiatr Rehabil Skills 2002;6:312-34. Singh A, Mattoo SK, Grover S. Stigma associated with mental illness: Conceptual issues and focus on stigma perceived by the patients with schizophrenia and their caregivers. Indian J Soc Psychiatry 2016;32:134-42. Schomerus G, Corrigan PW, Klauer T, Kuwert P, Freyberger HJ, Lucht M, et al. Self-stigma in alcohol dependence: Consequences for drinking-refusal self-efficacy. Drug Alcohol Depend 2011;114:12-7. Klingemann H. Alcohol and Its Social Consequences: The Forgotten Dimension. Copenhagen: WHO Regional Office for Europe; 2001. Room R. Stigma, social inequality and alcohol and drug use. Drug Alcohol Rev 2005;24:143-55. Garg R, Chavan BS, Arun P. Stigma and discrimination: How do persons with psychiatric disorders and substance dependence view themselves. Indian J Soc Psychiatry 2012;28:121-30. Schomerus G, Lucht M, Holzinger A, Matschinger H, Carta MG, Angermeyer MC, et al. The stigma of alcohol dependence compared with other mental disorders: A review of population studies. Alcohol Alcohol 2011;46:105-12. Loganathan S, Murthy SR. Experiences of stigma and discrimination endured by people suffering from schizophrenia. Indian J Psychiatry 2008;50:39-46. Assefa D, Shibre T, Asher L, Fekadu A. Internalized stigma among patients with schizophrenia in Ethiopia: A cross-sectional facility-based study. BMC Psychiatry 2012;12:239. Brockington IF, Hall P, Levings J, Murphy C. The community's tolerance of the mentally ill. Br J Psychiatry 1993;162:93-9. Hall P, Brockington IF, Levings J, Murphy C. A comparison of responses to the mentally ill in two communities. Br J Psychiatry 1993;162:99-108. Phelan JC, Bromet EJ, Link BG. Psychiatric illness and family stigma. Schizophr Bull 1998;24:115-26. Tsao CI, Tummala A, Roberts LW. Stigma in mental health care. Acad Psychiatry 2008;32:70-2. Barney LJ, Griffiths KM, Christensen H, Jorm AF. Exploring the nature of stigmatising beliefs about depression and help-seeking: Implications for reducing stigma. BMC Public Health 2009;9:61. Magliano L, Fiorillo A, Malangone C, Del Vecchio H, Maj M; Users' Opinions Questionnaire Working Group. Views of persons with schizophrenia on their own disorder: An Italian participatory study. Psychiatr Serv 2008;59:795-9. World Health Organization. The ICD – 10 Classification of Mental and Behavioral Disorders: Diagnostic Criteria for Research. Geneva: World Health Organization; 1992. Sirey JA, Bruce ML, Alexopoulos GS, Perlick DA, Raue P, Friedman SJ, et al. Perceived stigma as a predictor of treatment discontinuation in young and older outpatients with depression. Am J Psychiatry 2001;158:479-81. Werner P, Aviv A, Barak Y. Self-stigma, self-esteem and age in persons with schizophrenia. Int Psychogeriatr 2008;20:174-87. Roeloffs C, Sherbourne C, Unützer J, Fink A, Tang L, Wells KB, et al. Stigma and depression among primary care patients. Gen Hosp Psychiatry 2003;25:311-5. Mak WW, Wu CF. Cognitive insight and causal attribution in the development of self-stigma among individuals with schizophrenia. Psychiatr Serv 2006;57:1800-2. Yen CF, Chen CC, Lee Y, Tang TC, Yen JY, Ko CH, et al. Self-stigma and its correlates among outpatients with depressive disorders. Psychiatr Serv 2005;56:599-601. Mann CE, Himelein MJ. Factors associated with stigmatization of persons with mental illness. Psychiatr Serv 2004;55:185-7. Ward EC, Clark le O, Heidrich S. African American women's beliefs, coping behaviors, and barriers to seeking mental health services. Qual Health Res 2009;19:1589-601. Link BG, Struening EL, Neese-Todd S, Asmussen S, Phelan JC. Stigma as a barrier to recovery: The consequences of stigma for the self-esteem of people with mental illnesses. Psychiatr Serv 2001;52:1621-6. Jadhav S, Littlewood R, Ryder AG, Chakraborty A, Jain S, Barua M, et al. Stigmatization of severe mental illness in India: Against the simple industrialization hypothesis. Indian J Psychiatry 2007;49:189-94. Mishra DK, Alreja S, Sengar KS, Singh AR. Insight and its relationship with stigma in psychiatric patients. Ind Psychiatry J 2009;18:39. Dinos S, Stevens S, Serfaty M, Weich S, King M. Stigma: The feelings and experiences of 46 people with mental illness. Qualitative study. Br J Psychiatry 2004;184:176-81. Link BG, Struening EL, Rahav M, Phelan JC, Nuttbrock L. On stigma and its consequences: Evidence from a longitudinal study of men with dual diagnoses of mental illness and substance abuse. J Health Soc Behav 1997;38:177-90.